Some people complain about their slow broadband not knowing there are usually plenty of choices out there for faster speeds. According to OFCOM, 97% of the city’s homes and businesses in Bristol now have access to superfast broadband (download speed of 30 mbps and above), however, take up is lagging far behind. Nationally, only 45% of premises have taken up the offer of superfast speeds. Why is that? Traditionally, superfast packages have been more expensive than standard broadband packages – that will be part of the problem. However, some people aren’t aware of the new superfast choices now available to them, others are confused about choices and deals; and some will be happy with standard broadband and won’t see the point in changing. 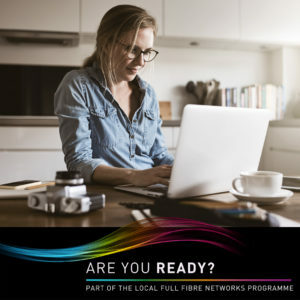 Find out more about superfast broadband – is it for you? Check what’s available. Use the Openreach superfast checker and Virgin Media checker to see what’s available. Choosing a broadband package can be confusing. The cheapest price may not be the best deal for you – think about how often you use the internet, what you use it for and whether your use is increasing with things, like music streaming and Netflix. The cheapest deals will be around standard broadband, however, your average speed will be slow and you will struggle with multiple members of your household using the internet at the same time. The internet’s much more fun with superfast and Bristol’s rate of internet data consumption is growing at an annual rate of 26%. Superfast fibre comes in two flavours – so, you’ll typically find a package at just under 40 mbps; and another one at under 80 mbps. The average speed quoted will be dependent on the length of copper cable from your fibre cabinet to your home. The longer the copper cable, the slower your internet will be, hence why we are striving for full fibre in Bristol. Some great tips from the Money Saving Expert website about getting a deal on broadband and telephone. Although with the rate of data consumption growth in Bristol and take up of services, like Netflix, we don’t agree that for many homes 10 mbps is enough!